The flint beetle family is a recurring family of enemies in the Pikmin series. It includes 2 flint beetles that behave drastically different from each other. Main article: Iridescent Flint Beetle. 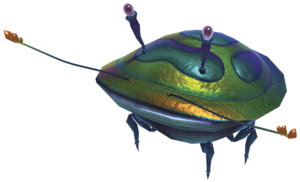 The Iridescent Flint Beetle is an enemy in Pikmin, Pikmin 2, and Pikmin 3. It is harmless and has a tough carapace to defend itself with, making it invulnerable to attacks. It dwells underground in fixed spots, but when approached, it emerges and scuttles around in a panic. Occasionally, it stops and provides an opportunity for the player to throw a Pikmin onto its back, making it flip and release a reward. Main article: Stony Flint Beetle. The Stony Flint Beetle is an enemy in Hey! Pikmin. It uses its back legs to push rocks and prevent passage through corridors. It is the only flint beetle to possess wings, which it uses to fly away after the Pikmin push the rock into a hole. This page was last edited on December 27, 2017, at 17:04.